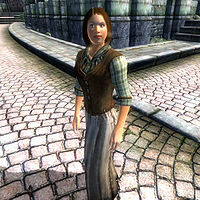 Rochelle Bantien is a Breton commoner residing in the southwest corner of the Imperial City Talos Plaza District with her husband, Samuel Bantien. Rochelle is also a frequent visitor to Cheydinhal, and can often be found there at the Newlands Lodge. While her husband’s questionable past remains a popular conversation topic amongst the Imperial City citizens, Rochelle is relieved Samuel chose to settle down and live his life at ease, just like her. She always wakes up at 6am and spends two hours wandering the ground floor until she sits down at 8am for a two-hour breakfast. Additionally, at 6pm she always takes an outside stroll in the Talos Plaza District before returning home at 8pm for a two-hour dinner before bedtime. Between 10am and 6pm her routine varies; on Morndas to Fredas, she travels to the Market District, where she browses around all afternoon until 6pm. On Loredas, she spends the entire day strolling around in the Talos District, preferably in the area near The Foaming Flask. Sundas sees her wandering the streets of the Temple District until 6pm, only interrupted at noon by a four-hour prayer in the Temple of the One. Rochelle was also supposed to play a role in the unfinished "Imperial Couriers" quest; at midday on the 2nd of each month, as long as Hafid Hollowleg is still alive, she will head to the Black Horse Courier and stay there for a brief moment before she resumes her usual schedule. On the 13th of each month, when the clock strikes midnight, Rochelle leaves the Imperial City for her monthly journey to Cheydinhal. After crossing the Talos Bridge, she heads north on the Red Ring Road, all the way around Lake Rumare, until she turns northeast on the Blue Road. The trip takes her approximately 16 hours and she usually arrives at Cheydinhal's western gate between 4pm and 5pm. Once there, she heads directly for the Newlands Lodge, and spends the next two days hanging out with the many Orc regulars. At midnight on the 15th, she leaves Cheydinhal and heads back to the Imperial City and her husband. Rochelle wears a set of middle class clothing: the rare zero-weight plaid shirt with light brown linens and a pair of russet felt shoes. She also carries her house key and a small amount of gold. When you meet her for the first time, she will politely introduce herself and her husband: "Rochelle Bantien. Samuel's wife. I'm glad he's settled down to training and the quiet life." When asked about the Imperial City, she will elaborate: "Samuel was a bit wild as a young man. The City will do that to you. Bad company, bad influences." When asked the same question, Samuel Bantien will add: "Rochelle and me just want the settled life nowadays." Esta página foi modificada pela última vez à(s) 19h11min de 14 de julho de 2013.